Want to Submit a Guest Post to Abrazo and Coze? At Abrazo and Coze we believe that most parents want to be superheroes in the eyes of their children, but don’t like the frustration, guilt and stress of aiming for SuperParent status. With that belief in mind, the goal of this website is to empower families to live their best life, by providing practical solutions to everyday challenges, covering topics including kids, love, and life. Parents can be their child’s superhero, without the stress of trying to live up to unreasonable SuperParent standards. One of the ways we do that is by supporting other entrepreneurial families who are looking for a relevant site to submit guest posts. By encouraging parents to share their knowledge and experiences with others, families can grow their business via exposure and credibility. By writing in exchange for exposure and backlinks we can also build up the Search Engine Optimization of your business or personal websites. We’d love to hear from you if you have good quality writing or graphic design skills and would like to share your expertise with a large audience of parents. That said, please take time to review this entire page. It should answer any questions you have about what we’re looking for and how the submission process works. Successful guest submissions are comprehensive and interesting. They teach our readers something about being a parent or present a new or unique way of living their best life as a laid back family. Information is typically supported by relevant, recent examples, original quotes, original graphics, and current data. We are interested in publishing any topic that parents care about. That includes things like kid crafts and activities, educational choices and considerations, positive parenting advice, relationship skill building for parents, adult or family activities, self-care, organizational or cleaning tips, recipes for family-friendly food, among other things. Original ideas, compelling story-telling, and high-quality writing. Abrazo and Coze will not republish anything that’s been published elsewhere. The article reflects the casual writing style and friendly and helpful tone of the Abrazo and Coze website and blog. We prefer articles that present information in a way that is relatable to parents and relevant to families. Proper attribution of data, quotations, and any outside content is referenced in the post. At most, two links to relevant articles on your own website in the body of the post. The article is inclusive of our diverse readership. There shall be no religious references, and vocabulary should otherwise embrace diversity. Please note that there is no specific word length requirement, however, guest posts on Abrazo and Coze currently range in length from about 800-3500 words, though most are closer to 1250 words. The bare minimum is 300 words, but short posts should be supplemented heavily with original high quality media elements. Here are some of the types of blog posts we accept. These styles are most likely to do well with the Abrazo and Coze audience. These posts should include hard data, actionable takeaways, and thorough explanations of the evidence supporting your conclusions. An evidence based post might include alternatives to spanking, for instance. It would be supported by evidence that demonstrates why spanking is inadvisable, along with evidence supporting why the alternatives are a better choice. The post should not be completely theoretical or academic in nature. Instead, it needs to provide families with actionable information to improve how they parent or live. These posts provide instructions to the reader to accomplish a task or actionable item. They can be step by step tutorials, how-to articles, or can provide background information for a more abstract topic. For instance, craft posts are step by step tutorials. Similarly, “how to organize your toy room” would also be an instructional article. An article describing how to breastfeed, although not a step by step tutorial, also falls within this category. It provides the background and supporting information to be able to accomplish the end goal of breastfeeding. Ideally, these posts will include visual diagrams, photos of each step, or supporting reference material. Checklist posts are similar to tutorial posts in that they present instruction on a new skill or activity. However, they are much more simplified. To make a checklist, you take a task and break it down into short, actionable items. For instance, you might write an article on what to pack when travelling with children. Or, it might provide reasons to choose a specific activity. List posts are similar to tutorial articles in that they present information beneficial to the reader. Instead of providing steps to complete a specific task, however, they consolidate a larger amount of information into smaller bite-sized chunks. For instance, rather than listing every way you can maintain a positive, healthy relationship with your spouse or partner, the list might include the “Top 10” or “Best Tips”. Although short list posts don’t include all of the information on the subject, they do provide valuable material to prepare a reader to execute an action, improve a skill, or make a decision. Long list posts are exactly like a short list, except much more comprehensive in nature. Rather than consolidating the information into the primary aspects, a long list would resemble an ultimate guide to the topic. The list should be an exhaustive compilation of information. These articles, by nature, are typically quite long. Media posts are quite popular and very shareable. Infographics, images, and short videos can all be highlighted as the focal point within a media post. It’s important to write a few paragraphs about the purpose of the media, but the visuals should be the focus. A media post with images as the primary focal point is likely going to illustrate the steps in completing a project. The visual elements should be compelling, easy to read, comprehensive, current, and sourced properly. In case you’re unsure of what exactly is an infographic, here is an example of a media infographic focused post: What Is An Infographic? The format of a beginner’s guide post can be quite varied. The common factor, of course, is that they provide basic information on the topic for readers. With that information, they should be able to implement a new skill, hobby, or technique. In a beginner’s guide, you would define the relevant terms and mention synonyms for those terms in addition to providing the required information. Ideally, there would also be reference made to external (or internal) pages to learn more on the topic. Myths vs facts posts can be fun to write. Basically, you compile a list of all the common myths you hear frequently about the chosen topic, and then present those along with the actual facts that correct or confirm the myth. This type of post lends well to quizzes, with the myths and facts set up as a series of questions with readers choosing if they are myth or fact. After each question, additional information is provided on the fact of the matter. Abrazo and Coze doesn’t currently have any myths vs facts posts, so you could be the first (and then highlighted here as the example)! has been previously covered on our blog. If you’re not sure, do a search. If you think you have a topic that is different enough from an already published post, but the topic overlaps, feel free to inquire using the Contact form. is too promotional for your company or organization. could be construed as a link-building scheme. contains affiliate links or links of a commercial nature. is offensive or supports violence, hate, or bigotry against adults or children. constitutes a complaint or grievance against individuals, companies, or organizations. Your completed post as a Word document. Please note, do not add font sizes, text colours, or double spaces after paragraphs (hit enter once). Image files (with attribution) should be sent in a separate file. Please note, all images should be 1080 x 1080 pixels square, except infographics, which should be 600 x 900 pixels or larger (ideally maintain a 2:3 ratio). A short author biography, written in the third person. Full URL links to your social media accounts and website. Mention which profile image you want as your biographical portrait: Gravatar, Facebook, Instagram, or Twitter. Include a short statement identifying the primary keyword phrase for which the post was written. You can find keywords by using the free tool at Ubersuggest. A 300+ word introduction to your post that will be published on your website (you will also be able to publish it on your LinkedIn profile or on Medium or another site if you feel it is a good fit). This introduction should include a place for a link to your article. Include a statement acknowledging that images and graphics can be used as Pinterest images or combined to make image collages suitable for Pinterest. Also, state that you understand some images will be shared across various social media to market your guest post. If your submission doesn’t contain original images or original graphics, Abrazo and Coze might still choose to publish the article if we can source suitable stock images. We will reply to let you know your post will be published if your article meets the Abrazo and Coze editorial standards and aligns with our content strategy. If your post will not be published, you will receive a response to let you know of that decision. That decision might take up to four weeks. All submissions will receive a response. If you do not receive a reply after 4 weeks, your submission was not received, so please resubmit. 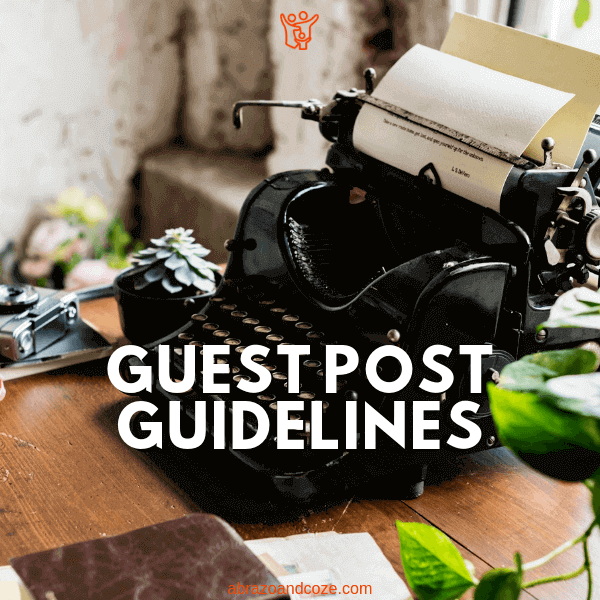 Not all guest posts received can be published. Article submissions chosen for publication on Abrazo and Coze are not permitted to be published on any other site, including but not limited to your own website, Medium, LinkedIn, Inbound.org, other blogs. Instead, you can publish an introductory blurb (included as part of your submission to Abrazo and Coze) that points to your guest post. You can also share your guest post across your social media networks. Abrazo and Coze reserves the right to edit and adapt your guest post content as we see fit, and update it in the future for accuracy and comprehensiveness. We also reserve the right to include calls to action to Abrazo and Coze content, including but not limited to email newsletters and downloadable content. Abrazo and Coze will add our own affiliate links, advertisements, and other monetizing aspects to the post as we see fit. Previous contributors to Abrazo and Coze who wish to write additional guest posts will be provided account login information to type directly into WordPress. The criteria above still apply, however, keywords will be decided upon in advance. Email anna@abrazoandcoze.com to discuss details. If you have connected with Abrazo and Coze on social media or offline about writing a guest post, we will work with you to determine a suitable topic, keywords, and other details to ensure your posts will be accepted for publication. All other submission requirements set out above apply.